Club member Tim Moore was the speaker at our regular club meeting yesterday and presented a program which quite literally challenged the status quo thinking about investing in the stock market for many “small” investor’s. Tim has a long history as a financial advisor, beginning his career at a large Wall Street investment firm where he was taught to sell products such as mutual funds and annuities. Over the course of time, Tim realized that the products and practices of wealth management didn’t provide sufficient growth opportunities for the middle class. The middle class can’t invest more, so they need to earn more. Warren Buffett knows, what academia has verified, that owning a handful of the “RIGHT” stocks, is the best way to build wealth for the future. What Tim refers to as wealth creation accounts. For many, that can mean owning shares in companies where we spend our money, such as “Amazon, Apple, Home Depot, Netflix, Starbucks and a host of others. A convincing argument was made, comparing portfolios returns of individual stocks to index funds over same time periods. He also spoke about how labor generates income, while ownership generates wealth. Displaying not only a deep knowledge base on this topic, Tim is also passionate about educating and empowering people, so that they may have more control over their destiny. 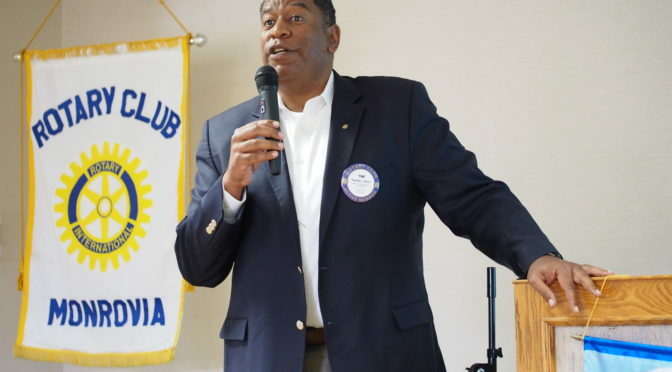 He’s been “preaching” this message at his church and at Rotary and in other groups at no cost because he so strongly believes in his message and his mission. 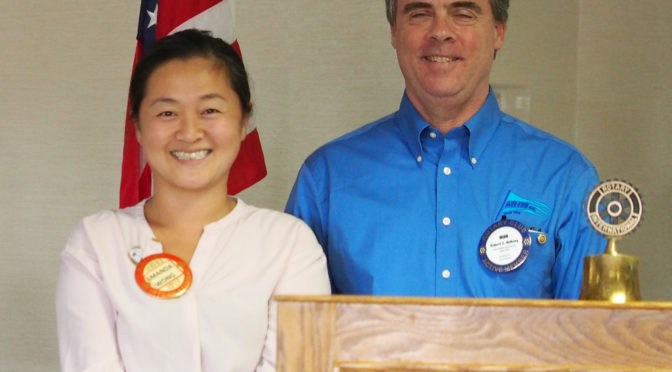 The Monrovia Rotary Club is pleased to welcome Amanda Wong to membership. Amanda lives in Arcadia and manages rental properties locally. Her passion is animal rescue. Robert Helbing is a California native. He came into this world in San Diego on January 1, 1962. His family has Midwest roots, and he moved to Chicago when his father mustered out of the US Navy. In 1969, the Helbing family returned to California, where Bob was raised in Pasadena. After finishing St. Francis High School in 1979, Bob enrolled in the California Institute of Technology, graduating with a degree in aeronautical engineering in 1983. Bob worked in the aerospace industry for several years, working on ballistic missiles. His projects included flights and flight hardware for the Minuteman, Trident, Peacekeeper and Small Missile projects. He left the industry in the wake of the post-Cold War downsizing, working in software development. In 1990, he joined the family firm, Air-Tro Heating and Air Conditioning in Monrovia. Bob is a third-generation engineer and a fourth-generation contractor. His family’s roots in contracting go back to the 19th century. He and his brother Tony have built Air-Tro to be the premier provider of HVAC services in the San Gabriel Valley, serving customers such as Occidental College, USC, Caltech, the City of Hope and many other institutions in the region. Bob served a decade on the board of the Institute of Heating and Air Conditioning Industries, holding the Presidency of the Institute in 2013-2014. 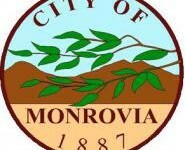 Bob has been a Monrovia resident since 1991. He and his wife Erin have three sons, now all in high school or college. 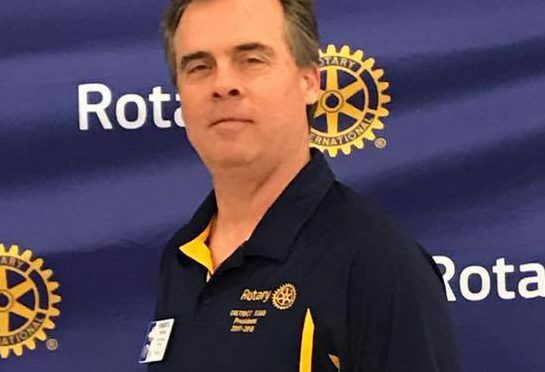 Bob is active in the community, having served on the Foothill Workforce Development Board for over a decade, as well as being on the board of both the Monrovia Chamber of Commerce and the Monrovia Rotary Club. 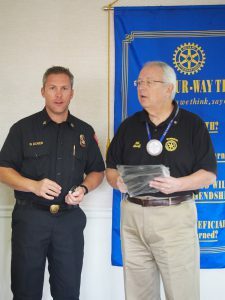 He is currently serving as Treasurer of the chamber, and is the newly installed President at Rotary. Bob has found involvement in the community to be a rewarding and enriching experience, discovering meaning in service to others and the delight in sharing that experience with fellow members of our community. The Monrovia Rotary Club has inducted Fire Chief Brad Dover to membership. Brad is being sponsored by Immediate Past President, Bill Shieff. 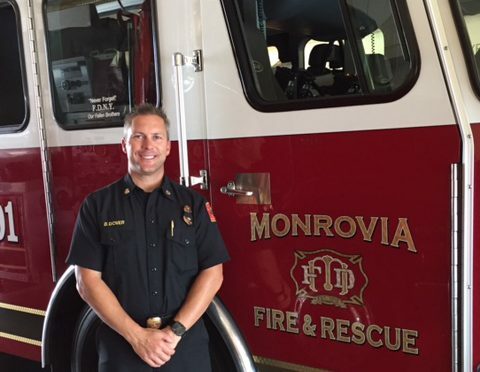 Brad Dover began volunteering for Monrovia Fire and Rescue in 1994 as a fire cadet. In 1998, he was hire full time as a firefighter. The following year, he was assigned as a firefighter/paramedic. In 2003, Brad was promoted to fire engineer, a position he still cherishes as one of his favorites. In 2006 he promoted to captain where he spent two years on an engine company. In 2008, he was reassigned as a captain on the ladder truck. He said that assignment is where he grew the most professionally and all of the pieces of incident management came together. In 2015, he promoted to division chief, where he managed day-to-day shift operations. He was also responsible for citywide emergency preparedness programs and department support services. Brad has a Bachelorette of Science degree from California State University, Long Beach. He has completed the California career track programs for Fire Officer and Chief Officer. He was fortunate enough to spend a number of years as part of a California USAR Task Force. Currently, Brad is attending the Executive Fire Officer Program at the National Fire Academy in Maryland. The graduate level program is designed for fire service leaders from around the country. Brad has been married to his wife Anne for the past 18 years, and has 13 year old twins, Blake and Ella. Away from work he loves camping, golfing and being involved in his children’s sports programs. As a die-hard Green Bay Packers fan, he insisted on naming his dog Lambeau, after one of the Packer legends. 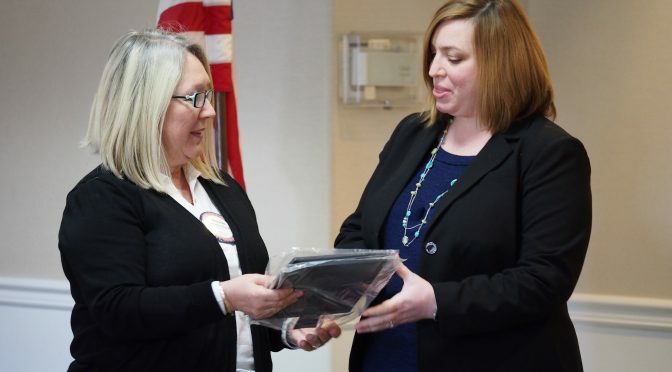 The Club is proud that a person such as Brad, who has spent a lifetime in service to others, has chosen the Rotary Club as an avenue of service.